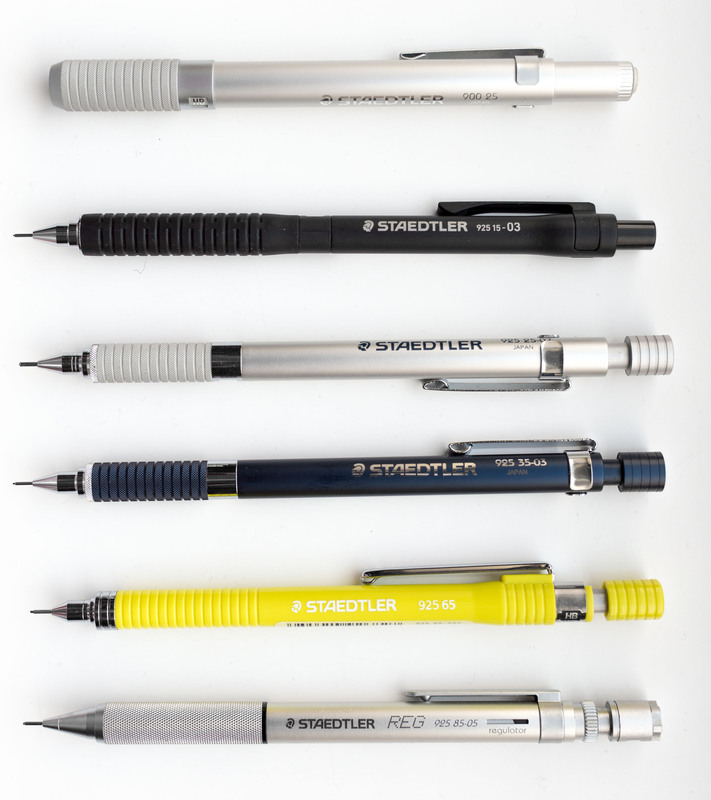 Today: a quick look at Staedtler’s new 925 15 mechanical pencil. Another pencil I got to know from Gunther. The 925 15 came out in November 2017, has an official price of ¥500 (~$4.40; £3.30; €3.75) and is available in 0.3mm, 0.5mm, 0.7mm and 0.9mm. In my opinion, it looks absolutely stunning. The grip section is made from Elastomer. One thing to note: as it is rather rubbery little bits of fibre or dust will easily stick to the grip section. The push button looks quite different to the push button found on other members of Staedtler’s 925 family. By the way, I have no idea how the numbers after 925, in this case, 15, are assigned. They don’t seem to be in chronological order, but they also don’t seem to indicate how cheap or expensive the pen is. The 925 15 has a much smaller push button than its relatives and comes with a hole. I couldn’t think of any practical use for the hole (checking whether the eraser is used up?) – the only reason I could think of was the same reason why pen caps have holes, so that air can flow in case anyone (most likely children) swallow the cap and it is stuck in the windpipe. ジムキング confirmed that this is the most likely reason for the hole in the push button. Here’s a family photo with some other 925s. The 925 15 is so nice, it deserves a centrefold picture. If it was a bit heavier and had a sliding sleeve it would probably become my daily mechanical pencil. I agree that this pencil looks exquisite! 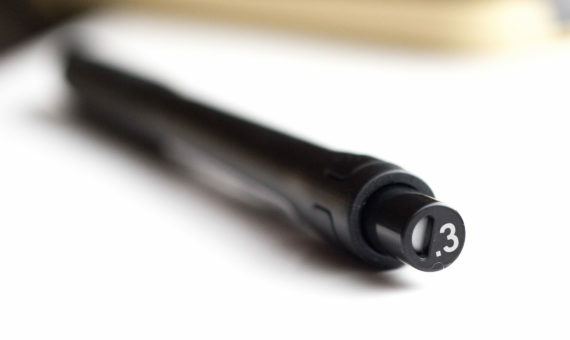 At first glance, it reminded me of the rOtring Rapid PRO without the red band, but I prefer how the tip of 925 15 looks. Shangching, by coincidence I have used my Rotring Rapid Pro again quite a bit recently and the Rapid Pro and the 925 15 are quite different in handling, despite both having a sleek, black look. The Rotring is very heavy, while the Staedtler is very light. The Rotring feels quite cold as the metal body conducts heat away from you, while the rubbery grip of the Setadtler doesn’t feel cold or hard at all. The old 925 25 had the lead indicator turning only if you would unscrew the front section, then you would set it and screw it back. I guess it was for security reason so you don’t turn it accidentally but I find it not up to the pencils level. Rares, some of the rubbery parts of items can become sticky, that is usually quite bad. I think Elastomer, as used in this pencil’s grip is also used for shoe soles and tyres, so I hope this pencil’s grip will last long. David, shipping costs were very reasonable. Do you plan to buy more than one diameter? Like most Japanese sellers on the Web, Rakuten ships via JP/EMS, which I have found to be reliable and fairly quick (usually 4-7 days International by air with online tracking). But the price for JP/EMS shipping seems a bit higher from Rakuten compared to other Japanese sellers. Example: For a shipment of up to 500g from Japan to the U.S., Rakuten quotes $17.65 while other sellers charge around $13.00. It’s no big deal really, especially given the lower price offered by the Rakuten seller. FedEx or DHL would charge a whopping $40+ for a similar service. How do you like .3 millimetres? Aren’t they too fine for everyday use? I ask because I never owned one. I like .5 or .7 if i do more writing as the lead lasts more which means fewer clicks. David, oh, so you’ll use it for drawing. I didn’t imagine it as a drawing pencil, but it is comfortable to hold and when drawing you probably don’t want a heavy pencil, so it might be great for that purpose. Shipping was very reasonable, but I didn’t have experience with buying small items through Rakuten. Thank you for the additional explanation. Rares, I might be the wrong person to ask as I even like 0.2mm very much. You could try a sliding sleeve pencil in 0.3mm. That way you don’t need clicks until the sleeve is completely in the body. I find a thinner but darker lead more legible and less smudgy than a wider lead. It’s a shame Staedtler doesn’t distribute this model worldwide. It’s great that shops like JetPens import and sell these pens in other markets, especially for pens where importing them as the consumer doesn’t make sense because of postage.